When text is too large to fit in a cell, you could increase the cell size, ie. increase the row height, the column width or both. This is not always practical, as the higher the row height is, the less rows can be displayed. The same applies for the column width. The text could also be displayed cut-off but this solution is also far from ideal. Now, an alternative solution is available with the capability to add a vertical scrollbar to a cell. Any cell can as such have its own scrollbar and scroll separately the cell's text or HTML formatted text. 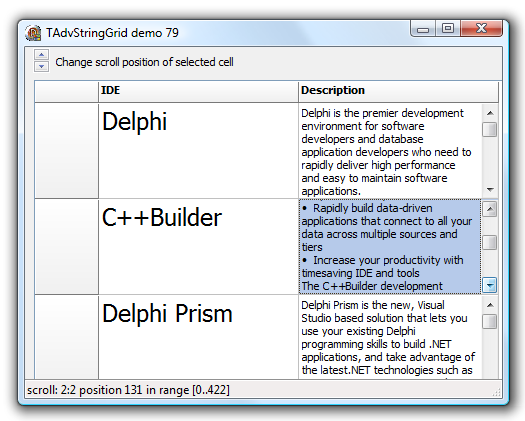 This feature is made available with the grid.AddScrollbar() method. With this method a scrollbar is added to a cell. The scrollbar range and pagesize can either be automatically set according to the size of the text in a cell or can be programmatically set. grid.AddScrollbar(col,row: integer; AutoRange: boolean); Adds a scrollbar to cell col,row and when AutoRange is true, the scrollbar range and pagesize is automatically calculated.